Directorate of Public Health and Family Welfare (DPHFW) has released the notification for AP DPHFW Recruitment 2018. The recruitment will be done for the posts of the Civil Assistant Surgeons in Primary Health Centers. DPHFW has released the application form for AP DPHFW Recruitment 2018 on September 26, 2018 at cfw.ap.nic.in. The last date to apply for AP DPHFW Recruitment 2018 is October 25, 2018. Recruitment will be done for total 1171 number of vacancy. From this page, the candidate will get full information regarding AP DPHFW Recruitment 2018. Latest: Application Process for AP DPHFW Recruitment 2018 has been started. See the postal address details from below. The AP DPHFW Recruitment 2018 will be done on the basis of educational qualification, experience etc. For more information regarding AP DPHFW Recruitment 2018 see the below-mentioned schedule. Name of the post is Civil Assistant Surgeons. The AP DPHFW Recruitment 2018 is done for total 1171 number of vacancies. For more details regarding the vacancy see the below-mentioned vacancy distribution table. Application Fee: Rs 500/- | For SC/ST/PWD & Women fee will be exempted. Payment: Demand Draft (DD) of Rs 500/- payable at Vijayawada drawn in favor of Director of Public Health and Family Welfare, A.P., Gollapudi, Vijayawada. Postal Adress: Application will be sent at the below-mentioned address in the same format as given below. Before filling the application form candidates should go through the eligibility criteria first. If the candidate will no full fill all the eligibility criteria that candidate will not be considered for the further recruitment process. 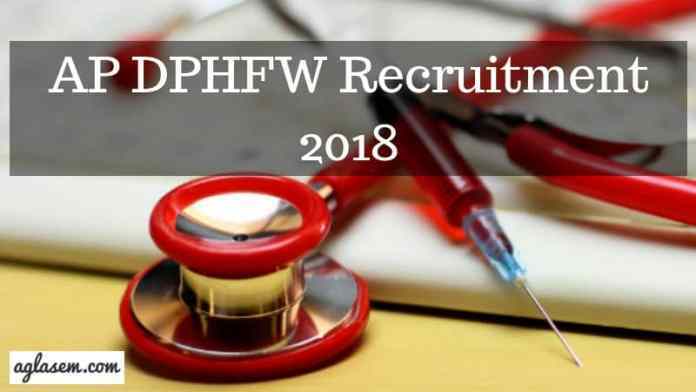 From below see the detailed eligibility criteria for AP DPHFW Recruitment 2018. Nationality: Candidates should hold the Indian Citizenship. Age Limit: Candidate must not be exceeded 42 years as on July 07, 2018. Education Qualification: Candidate should have qualified the MBBS from the recognized Institute or university. The candidate will be selected on the basis of marks in the qualifying examination, experience, internship, certificate. Candidate should qualify the minimum basic criteria then only the candidate will be considered for the further recruitment process. Selection of the candidate will be done on the basis of below-mentioned criteria. 75% marks in the qualifying examination (Aggregate of Marks obtained in all the years). 15% Marks will be assigned to Civil Assistant Surgeons working on contract basis. 10 mark per each completed year after completion of internship along with necessary qualification with the internship. Applicants should have minimum 06 months of continuous service as Contract Medical Officer are eligible for weightage. Candidates should receive the satisfactory remark in service. 2.5, 2.0, 1.0 Marks per Six months in Tribal area, Rural Area, Urban Area respectively. 1.0 marks per each completed year after gaining the necessary qualification. The AP DPHFW Result 2018 will be based on the education qualification, internship, certificated, experience. After shortlisting, the candidates result for the shortlisted candidates will be announced by the authority on the official website. The result will contain the name of the candidate, application registration number and rank etc. The shortlisted candidates will be called or informed for the counseling round but it is not necessary that if the candidates were called for the counseling round are finally selected. On the day of counseling, candidates need to carry the below mentioned documents. MBBS Degree Certificate / Provisional. The recruited candidates to the post of Civil Assistant Surgeons in the Medical Institutions will get the pay scale of Rs 40270-1110-42490-1190-46060-1270- 49870-1360-53950-1460-58330-1560- 63010-1660- 67990-1760-73270-1880- 78910-2020-84970-2160-91450-2330- 93780 and other allowances as applicable under the rules in force from time to time.